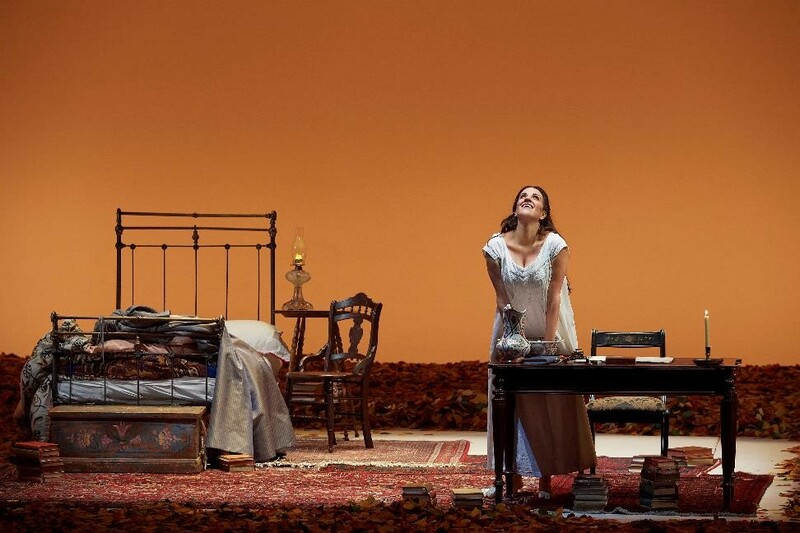 Less is not always more, especially in opera staging and design, but director Robert Carsen and his creative team have achieved a pared down Eugene Onegin that is at the same time distilled and intensified. Besides Carsen, the contributions of set and costume designer Michael Levine, associate director Peter McClintock and lighting designers Jean Kalman and Christine Binder cannot go unrecognized. It’s an exquisitely atmospheric production that has had a long life—it premiered at the Met in 1997 and was transmitted in HD in 2007—but is young again as the Canadian Opera Company’s season opener, seen on Sept. 30th. Tchaikovsky himself adapted Pushkin’s eponymous novel-in-verse into a libretto that he broke down as Lyrical Scenes in Three Acts and Seven Tableaux. Pushkin’s Onegin is comedic and irreverent in tone, while Tchaikovsky’s is an altogether darker, Romantic affair. Nominally about the aristocrat who rejects a young woman he sees as below his station and hopelessly earnest and unworldly, the opera is populated by characters who are all much more interesting than Onegin himself. The repudiated Tatyana marries into even higher nobility, to Onegin’s astonishment. Poet Lensky goes from sincere and carefree to wounded, foolhardy and tragic. Tatyana’s joyful sister Olga has the death of the beloved coming her way. The one-aria Prince Gremin, Tatyana’s husband in the final act, disarms by wearing his heart on his sleeve. Everybody takes a leap out of themselves, as it were, except Onegin. 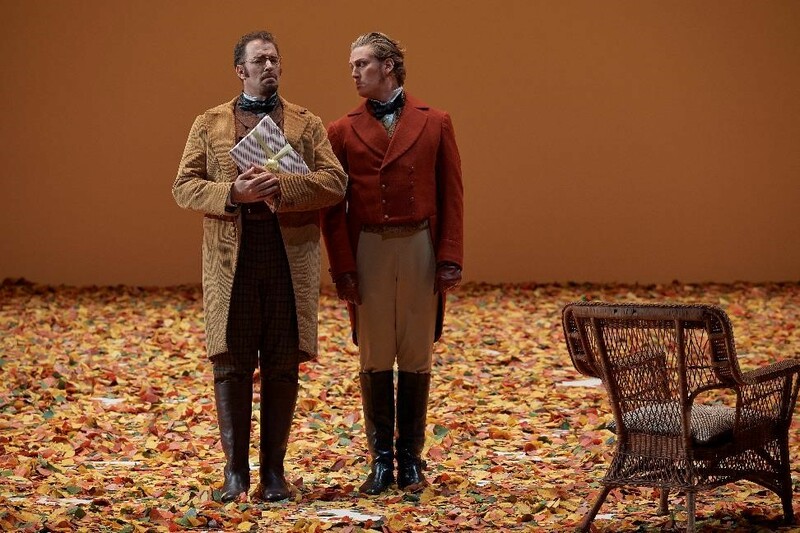 Gordon Bintner (Eugene Onegin) and Joseph Kaiser (Lensky) in Canadian Opera Company’s Eugene Onegin. Photo: Michael Cooper. Bass-baritone Gordon Bintner’s subtly exaggerated-for-comic-effect Onegin is therefore fitting. Stiff and upright just a speck too much; top hat always on hand; more a mannequin than a beast in the vein of Don Giovanni. Bintner’s Act I aria to Tatyana is cold more than anything else—there is condescension yes, but it’s mostly distancing. In every tableau of this production there is something to delight the eye and the ear. In the autumnal opening scenes as the peasants emerge on stage after they’ve announced themselves with the work song Bolyat moi skory nozhen’ki, an Orthodox priest comes in first with a monk behind him, and the overtones of Orthodox chant in the music become evident. Near the end of the Letter Scene in Tatyana’s little room, after the lines “Perhaps all this is meaningless…delusion of a naïve soul,” a French horn from the COC orchestra, Scott Wevers, pairs up with her: Tatyana and her sentinel; nothing else is awake. 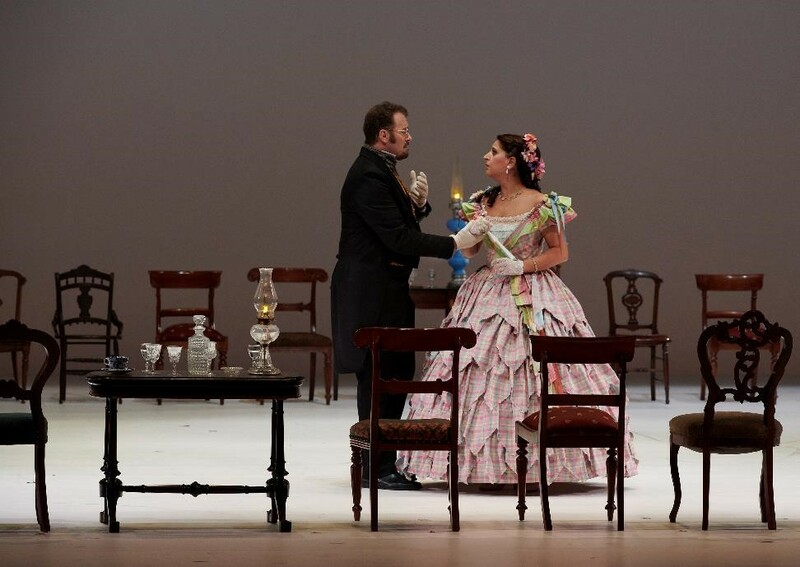 Gordon Bintner (Eugene Onegin) and Joyce El-Khoury (Tatyana) in Canadian Opera Company’s Eugene Onegin. Photo: Michael Cooper. A gray palette is chosen for the scene of Onegin’s first rejection, and a sober, untheatrical white for his final encounter with Tatyana. Lensky’s aria and the duel with Onegin take places in soft focus, as if through the mist, or perhaps it’s snowing heavily, or it’s an out of focus photograph? The blocking is unusual in the duel itself, as Lensky is facing the audience when he’s shot while we’re peering over Onegin’s shoulder. Tatyana’s modest Act II countryside, name-day ball takes place in a small, enclosed square of chairs, filled to the last inch with guests. Women wear dresses with large floral prints and bright colours; Monsieur Triquet and his name-song bizarrerie is what passes for entertainment (in some productions, as Triquet sings, Onegin is laughing from the sidelines; in this one, he can’t even be bothered to react). The killing of Lensky in the duel and the tableau immediately following it during the grand polonaise are ingeniously connected as Onegin’s bewigged footmen come in, clean up the scene, take Lensky’s corpse away and dress the indifferent Onegin for the next ball. Six years have passed. Onegin is still living aimlessly, and still dressing smartly. Speaking of that blast of a polonaise which takes a turn for the macabre: the COC orchestra under Johannes Debus’ baton gave a nuanced reading of the score, always attuned to the opera’s changes of mood and pace. Tatyana suits soprano Joyce El-Khoury. She has the requisite sweetness of tone and dramatic commitment, though she was maybe too even and sensible as a character. There was no excess of passion and no loss of control where some of that is called for. The voice is just the right size for the house and the orchestra, never soaring but never getting drowned-out either. Gordon Bintner was a reliable, well put together Onegin, and some of that frostiness of demeanour will come in handy for his Figaro Counts down the line. 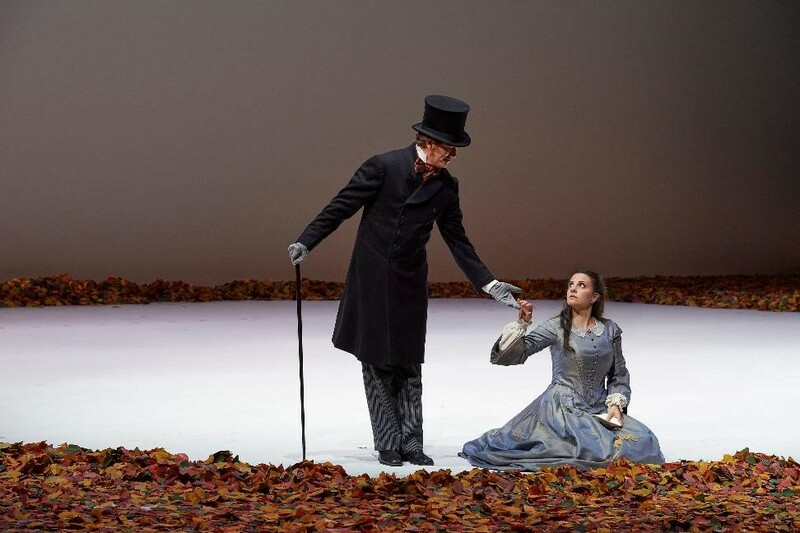 Joseph Kaiser (Lensky) and Varduhi Abrahamyan (Olga) in Canadian Opera Company’s Eugene Onegin. Photo: Michael Cooper. Tenor Joseph Kaiser as Lensky, on the other hand, really went for it. There was a sense throughout that Lensky was always on the edge, always tempting fate. He is alone on stage for Kuda, kuda before the duel, but as the view is blurred, we never see his face. He is betrayed by his friends and faint in the gaze of the audience. Varduhi Abrahamyan’s Olga was most at ease in the Russian idiom, navigating the low notes effortlessly with her full and dark mezzo. Olga is bubbly and light in demeanour but grave in tessitura, and this mezzo married the two without difficulty. Bass Oleg Tsibulko as Prince Gremin, tenor Christophe Mortagne as Triquet and mezzo Margaret Lattimore as the Nurse, Filipyevna, made the most of the modest airtime that they have. In short, the singers were all good, and worked well as an ensemble, but nobody stood out as particularly devastating. Not a weak link among the cast, but not an outstanding one either. A whole lot of enjoyment, without the goose bumps. And that’s just fine: with a production so intelligently and unfussily staged and conducted, mission very much accomplished. Previous articleLive-streaming: why are Canadian opera productions missing from the worldwide phenomenon?